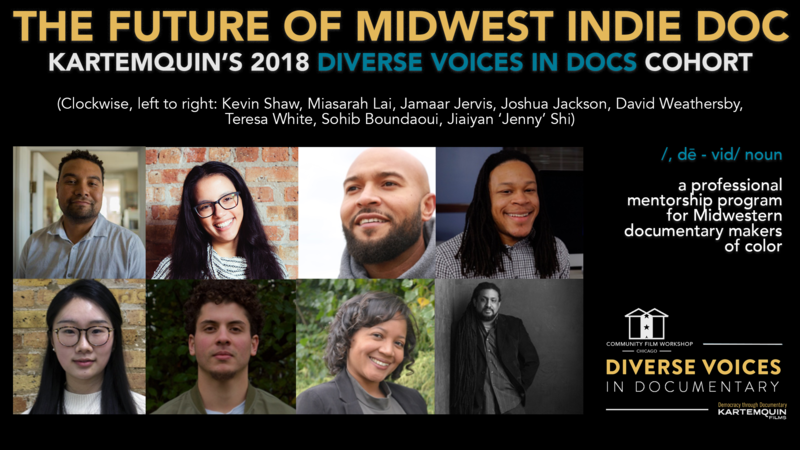 Kartemquin is thrilled to announce the eight new members of the 2018 Diverse Voices in Docs (DVID) cohort: Kevin Shaw, Miasarah Lai, Jamaar Jervis, Joshua Jackson, David Weathersby, Teresa White, Sohib Boundaoui and Jiaiyan 'Jenny' Shi. This year's mentors include Pamela Sherrod Anderson, Margaret Byrne, Ian Robertson Kibbe, Shahari Moore, Kelly Richmond Pope, Pemon Rami, Susanne Suffredin and Shuling Yong. Now in its 6th year, DVID is a professional development and mentorship program for documentary filmmakers of color, created by Kartemquin Films and the Community Film Workshop of Chicago. The chosen cohorts receive hands-on advice from experienced Kartemquin and Community Film Workshop staff and award-winning filmmakers, before pitching to a panel of major funders, including representatives from ITVS, MacArthur Foundation, WTTW Channel 11, POV, Chicken & Egg Pictures, and Bertha BritDoc Foundation. This past October, a graduation ceremony for the 2017 DVID fellows was held at the Reva and David Logan Center for the Arts. Sabaah Folayan, the director/producer of acclaimed Whose Streets? provided the key note speech. "Stay open, stay true, stay human...It is our job to keep pushing the door open until we don't need to use diversity as a proxy for skin color." advised Folayan. Currently, two films from DVID fellows have become Kartemquin projects: Minding the Gap by Bing Liu and All The Queen's Horses by Kelly Richmond Pope. Minding the Gap world premiered at the 2018 Sundance Film Festival, earning the fest's Special Jury Award for Breakthrough Filmmaking. All the Queen's Horses world premiere at the 2017 Martha's Vineyard African American Film Festival, earning the fest's HBO Spotlight Award for Best Documentary. The film is currently on a robust theatrical run. Learn more about Diverse Voices in Docs, and how to apply here.